I don't rave about many stews, but this one I shall. The carrot and parsnip were perfectly cooked, the chick peas melted in the mouth and the Bulgur wheat gave it that extra texture and the fat red fiery looking chillies gave it that background heat. I can't believe its only taken me two yeas to make it again. This is one of those stews that you should 'Eat as it is'. I don't think it needs an accompaniment like bread, as the Bulgur wheat, little as it is, does bulk up the stew and fill you up. I made this in my black clay pot, so it could be served straight from the oven to the table. It can also be made in an ovenproof casserole dish, even a slow cooker if you have one. It is really a straight forward recipe and one to make when you have other things to be getting on with, indoors or outdoors. Just place all the ingredients into the pot, give it a stir now and again, and then add the final ingredients 30 minutes before serving. As the domestic goddess Nigella Lawson would say 'how easy is that!. In a oven proof casserole dish or clay pot add the vegetables, tomatoes, olive oil, bulghur wheat, whole red chillies, herbs and spices and pour over the hot stock. Cover with a tight fitting lid and bake in the oven at mark 4 for 2 hours. Remove the lid and stir in the beans and tomato paste. Cover and return to the oven for a further 30 minutes until the vegetables are tender. Remove the stew from the oven and season to taste. Allow to stand for 10 minutes before serving sprinkled with the chopped parsley and optional drizzling of good olive oil. Adapted from Vegetarian Good House-keeping. Oh boy, that looks like one delicious stew! Perfect for the colder months. What an absolutely lovely meal. 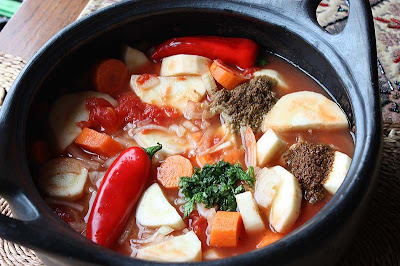 I often rave about stews and this one looks exceptional. Thanks for sharing! These types of recipes are great for when you're out at the allotment or have other things to do, and you want to eat on your return. It looks delicious and filling too. Mmmm, that looks absolutely delicious! Will pick up some bulgar wheat tomorrow and give it a try. It really is PERFECT for the wintery season. The spice warms you up and the veg, pulse and grain fill you up. We have some left over, so will probably be eating that for our lunch later on. Thank you so much Leslie. I am really pleased you like it. So lovely to make your acquaintance and Thank you so much for coming by and commening on my blog. 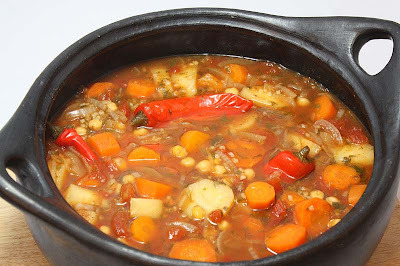 This really is a delicious stew, esp if you like it spiced. I do hope you enjoy this dish if you make it. Its the first good weekend we've had in a little while. the suns peeking out a little and neither of us is coughing. You take care. Spring is finally arriving here in Illinois...and I just picked up some parsley seeds among other packets. I think I'll wait for my parsley and veggies to grow before I try this one. It looks wonderful. Do we really need to use a clay pot? Hope you're having a wonderful weekend...and thanks for popping in over at Maggie's. So grateful for your friendship here in blog land! This looks so yummy, colourful and comforting. I would love a bowl(or two or three)! Your stew looks absolutely delicious! It does sound like my kind of food, I can't wait to give this simple recipe a try, YUM! 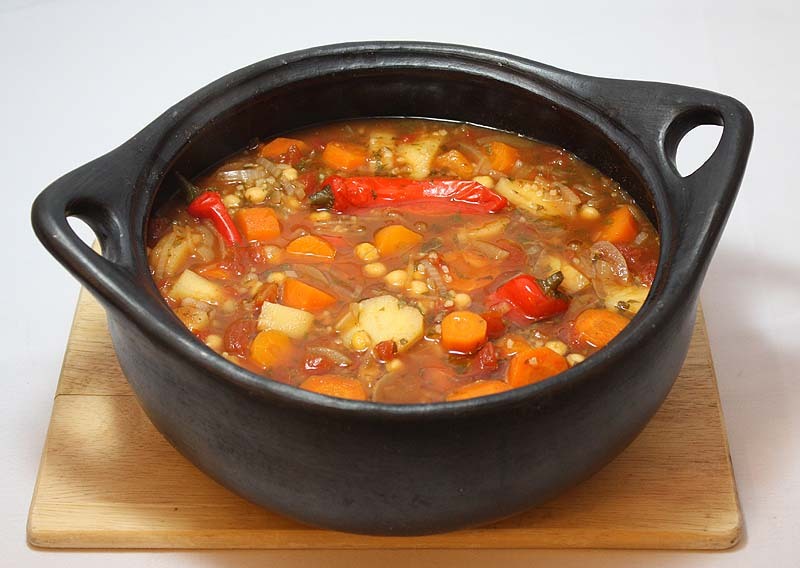 I really love the look of your black clay pot, you just use it from oven to table. What a great pot! This stew looks fantastic, and is right up my alley - it uses all the kinds of ingredients and spices I usually have around. Definitely going to give this a try. I LOVE chickpeas and chili... and mint, and bulgar, and just about everything in this stew. Yum. I would have been more than delighted to have shared some with you. Thank you so much Oraphan. I really was impressed with you garden and what you had growing. So thank you for sharing that little paradise of yours. I am so, so pleased and do sincerely hope you enjoy it. your clay pot is GORGEOUS ! It is rather wonderful. I hope it lasts!